Your AutoComplete component is great, but i discovered some issue. When i set in Project properties “Required flash version” to 10+ (10.0.0 or 10.0.22), submit of found autocomplete-item by ENTER doesn’t work (in property “selectedItem” is object of selected item, but text-input view is empty). When i set required flash version to 9.0.124, all works fine. Thanks very much for pointing this out. I’ve been able to track this down to the change handler for the TextInput. It looks like if you click enter in 9.0.124 it doesn’t dispatch a change event while in 10.0.0 it does. I’ve created a post on the Adobe forum to see if anyone is aware of this being a bug. For now, I’ve implemented a workaround in the code. I’ve checked a new SWC into the google code site, please give it a try and let me know if it resolves your issue. Hillel, thank you for your flash-fast response! Your workaround is working perfectly, good job! We use your AutoComplete component for thousands of items, but also for 20 items. It would be usefull, if we could set a flag, for example “comboBoxMode = true”. This feature will show down-arrow on right side and when you click on arrow, it display the entire menu. What do you think about it? This feature is beyond the basic AutoComplete functionality, but it would be usefull. I have just tried your component today. I’ve checked at least 5 autocomplete combobox, and spent 20 hours with bug-fixing, without success. So, I downloaded your code, and found the issue, mentioned before. Thanks for the fast fix, it works for me too, and helped me a lot! When i use “prompt” property and prompt is displayed, user must click into textinput two-times for focus it. This is user-unfriendly and inconsistent with functionality without the use of prompt feature. I agree, having to click twice to focus is unacceptable. The challenge is I’m unable to replicate the issue. Does it work correctly for you when you try it in the demo? I’m planning on adding a comboBox button in the future, but for now you could do something like this (note, there was a slight issue with the dropDown when using this approach so I checked in a new SWC to resolve it). Btw, problem with focusing is only in one specific form in our large application. Is it possible to quick edit the selected item?For example my data provider contain three record like “value1″,”value2″,”value3”.Now by mistake you select “value2” instead of “value1”. I want to select “value1” by replacing “2” with “1” from “value2” and validate it. In the current scenario is it possible to accomplish this task. Please help.If you are not able to understand my question please let me know. It’s a bit of a hack but give this a try and let me know what you think…. One other quick point: you’re may want to set backspaceAction=”remove” in the AutoComplete component. This way you’ll go right into edit mode when clicking the backspace. Thanks a lot & thanks for your awesome reply.I am going to implement your logic. then selected item comes in edit mode. Because if we click the remove icon then also handleSelectedItemsChange fuction is getting called. handleSelectedItemsChange function when you click in remove icon. Add a private variable called _lastKeyPressed and store it when the user presses a key. Note, the priority is set higher b/c we need to catch it before the AutoComplete does. Then in the handleSelectedItemsChange add a check that _lastKeyPressed equals Keyboard.BACKSPACE. Can I use Clipboard to paste the copied string into AutoComplete and then showDropDown()? Thank you for your responding! Hillel, thank you very much! It works, but unnecessary to call AC.showDropDown(). got a question concerning the dropdownwidth. I’ve noticed that the drop down list’s width, when not set explicitly, is equal to the input’s width, regardless of the width of the dataprovider’s items’ width. However, specification of the combobox’s property is that it is equal to the max value between 100 and the largest width of the dataprovider’s items. did i miss something or is there a bug? I’m sorry, I’m not following. Where did you get the 100 value from? Essentially you have two options: by default it’ll just match the input’s width or you can specify a width in which case the dropDown will just match the width (regardless of the width of the items). I follow you now, the AutoComplete component doesn’t extend from the ComboBox class (so it doesn’t implement this behavior). If you decide to implement this feature let me know if you need any help getting it working. My bad! i thought it was an editable Combobox type of thing. Well in that case, i’ll go ahead and make the modifications myself. In the examples, I see the “facebook style” has small “x’s” to delete items – but I can’t figure out how to get the “facebook style” to have those delete X’s when I’m using it with an AdvancedAutoComplete. I’m probably missing something – but is there some property I need to set? I found a bug in match highlighting. When i wrote “pa”, it highlight also “bo”, “br”, etc.. Very nice!! I actually wanted to code it this way initially but had trouble getting it working. Thanks very much, I’ll include your change in the next release. Thanks, that’s a good suggestion. I’ve incorporated the change. Thanks and great job on creating such an excellent component. I am working on an application that uses the AutoComplete and I am adding the ability to display the full dataProvider on FlowBox focus. When I have a working version, would you like me to post it up here for your approval? Ideally I would like to view the latest version of the source, but the google code site is currently displaying a “Forbidden” message when I access it. Do I require an account to use it? Yeah, I’d love to see what you’re working. Maybe you could post a link to an example. I’ve just fixed the issue with the google code site, you should now be able to access it. but i having a problem how can i set the global xy to local xy when i am creating its default starting from x=0, y=0, when you put any text also there is another problem seleted item appears with a button how can i disable that anyway , i am using Flex 4 , everything is fine except above those lines..
I’m sorry, I’m not sure I understand your global/local issue. You should be able to control how it looks by setting the selectedItemStyleName property. Is it possible to select multiple record with ctrl or shift key.As I know my autocomplete component availble for multiple selection. So is it possible to select mutiple records using only mouse click & after selecting all records user click the select option to dispatch the selected records. Please give some idea whether is it possible or not. Anticipating to get ur feedback soon. Sorry I have made one mistake in my previous mail.Is it possible to select multiple record with out ctrl or shift key in datagrid.As I know my autocomplete component availble for multiple selection. So is it possible to select mutiple records using only mouse click & after selecting all records user click the select option to dispatch the selected records. I’m sorry, the component doesn’t currently support that feature. If you’d like to implement it I’d be happy to help. Thanks for your reply.Yes I want to implement this feature in this component.Could you please guide me with some link or some hints. Currently the buttons have the toggle property set to true. You’ll need to set this to false and then manually track which buttons are selected. For the case of multiple selection,can we increase the height of flowbox(textinput) dynamically upto certain length. Hi–Your AdvancedAutoComplete component seems like just the solution we need compared to the buggy & not quite supported Adobe version. However, it seems to be quit a bit bigger and more importantly when we build a Flex application with it the result is very large. Are we missing something (we’re experienced programmers, but very new to Flex & Flash) about how to correctly use the SWC or build the SWF? We’re seeing sizes close to 1MB even for fairly small applications. Yup, my autoComplete is definitely bigger. That’s actually why I split the component into the basic one and the advanced one. Here’s a way to cut down on the size of the final SWF. Also, this may be obvious (I missed it at first), make sure you’re exporting a release build (so you don’t include the debug code). I’m pre loading some data in a component using the addItem function. then, when the user tries to add some new records within the component (multiple selection) it doesn’t grey out (lock) the already pre loaded records. any ideas how I can lock the pre loaded records so the user can’t select them again and we won’t have duplicates. Please let me know if this doesn’t solve your problem. I want to display the dropdownitem renderer as treeview mode. Now if user select Show all. It will display whole structure. Actually already I spend a lot of time but not find any good solution . Could you please help me with some hints. How can I modify your component to achieve the above requirement. I’m sorry, I don’t believe this will be easy to accomplish. The item renderer is used to display a single item but in your case you need a single renderer (the tree) to display all of the items. some idea, how can I accomplish the above functionality. It would be great if any of u can provide some guideline/link etc.. If any of u think it is not possible to accomplish this please tell me the reason so that I can tell to my boss. If is there any other possible solution to achieve the simlar kind of functionality then I can design my own component but before to do that I want all of your suggestion how can I design this component. If you want to give me the suggestion u can mail me home4toto@gmail.com. No wonder people are showering praises on you. This is one of the most comprehensive user extensions I have ever seen and I am not talking just about flex! I had some 3 or 4 small issues that your extension was not providing. But most of them were already encountered by other users and was explained in detail in the comments section. Thanks again! Fixed the problem. Issue was I’m using ‘import artwork’ to skin my app. When you import artwork, it also generates a css file too. Just deleting the entry in that for ‘textInput’ fixes the problem. Can you please send source code on my mail send me your mail so I can contact you? The source code is available as a download on the blog. Well, it seems I have no permission to put the code in here. I’m curious to see how you implemented it (I get that request a lot). If you could email me the changes that’d be great. I need source code for autocomplete component without button style as Vee said. I try to set selectedItemStyleName to none but still got button style. The component currently doesn’t support this. I seem to be getting this request a lot lately, I’m going to consider implementing it in a future release. For now… here’s a comment which discusses a hack implementation of this sort of feature. Presently I am facing a big problem & it would be great if you provide some help on this. Presently my dataprovider can contain >100K records. So actually what I want, to use two seperate data provider one for dropdownItemRender (Which contain only few important data) means every time when you use Autocomplete.textinput option it will use this dataprovider. Another dataprovider for browser option which can contain all data. (Means here you can search all your data among 100k records & select that records). 2)Again reassign the dataprovider for browser option on handleItemClick function and remove this data from dataprovider when you are closing the browser option. But I think there should be a different way to implement this.If is there any different option please suggest me with that. Where is the link for the simple auto complete box without all the extra features? There are two components: the AutoComplete and the AdvancedAutoComplete. They are both in the same SWC (and are therefore both in the same download). I need the ability to decide the disable color for the AutoComplete, my usage also includes disabling just the SelectedItem so even better if I could also specify a color for this too. I’m fresh out of ideas how to get this working without modify the code, any recommendations? The ColorDemo provides a good example of how to do this (the source is in the examples folder). It uses the ColorItemRenderer.mxml file to control the color of the text based on whether or not the item has been selected. I actually meant the colors after the item has been selected and is displayed in the AutoComplete box, when you disable the AutoComplete it switches to a very light shade of gray. I’ve tried experimenting with the CustomSkin example to no avail. Ahh… gotcha, that’s a bit trickier. The CustomSkin applies the same skin to all of the selected items. You could try looping through the flowBox’s children, these will (except for the last child) be SelectedItems. You could then manually set the styleName property of the button component to a skin. Почитал, порадовало 🙂 А может и правда всегда думать исключительно о хорошем, а все плохое переворачивать? 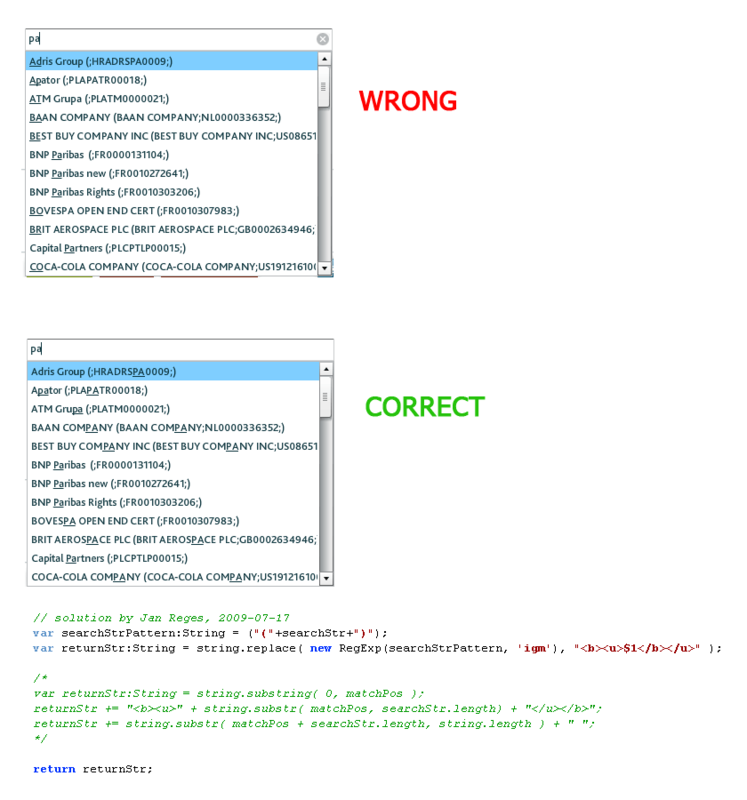 I’ve been having some problems with the sizing of PromptTextInput being set to a neglible value if an AutoComplete component is created for a hidden container. The consequence of this is that typed text is then not echoed to the screen. I think my previous comment may have been missed but is quite a significant issue for my usage of the tool so worth repeating. BTW are you thinking of doing a new release soon to incorporate the various fixes? Thanks for submitting the fix, I’ll have it in the next version. I’m hoping to release a 1.1 sometime soon. Great component – thank you! If i’m not using multiple item entry, I would like to be able to hit the ENTER key to do something (like submit a form). How would I do this with your component? You should just need to set the defaultButton property of the form to your submit button. Let me know if you have any trouble getting this working. I tried the STYLE_FACEBOOK and selectionLayout=”vertical” together but didn’t work as expected. I don’t want to display multiple selected FACEBOOK styled items on one line. Is there another way to do this with the FACEBOOK style? BTW, thank you for a great component! I’m sorry, the styles are only applied when using the horizontal layout. You’ll need to create a custom itemRenderer for the list component for it to work in the vertical layout. but some reason it does not work. Could you please help me on this topic. I don’t believe you can use the embed tag inside of the xml. 2) Question: Normally, if I have allowMultipleSelection=”true”, an item is grayed out if I try to select it twice. But… If i prefill the autocomplete with values coming from the datagrid’s dataProvider (Tom, Jim), then populate the AdvancedAutoComplete’s dataprovider with a much larger list that also includes Tom and Jim, I can select Tom or Jim multiple times. This behavior makes sense because Tom and Jim are unique at that point – my question is: is there a better way? 1. I’ve made some changes which *may* help with this. Can you please try using the latest code from the google code site. Note: you need to do a SVN checkout to get the latest code. 2. I’m sorry, I’m not sure I’m following what you question is. Could you please try putting it another way. Thanks for the reply. Unfortunately the latest code from google code SVN doesn’t have any effect on the FlowBox.mxml:57 error. I’ve tried Flex SDK 3.2 and 3.4. I have allowMultipleSelection = true on the dataGrid, if that matters. I’m not sure, are you using custom code for the itemEditEnd event (if so could you please post it). I am using AutoComplete ComboBox,right now it displays the matching options based on the typed input value. is it possible to display the entire list and highlight the matching option based on the user text??? But I did not understand how can we apply the timer concept in the autocomplete component. Could you please help us with some code snippet. A simpler solution may be to simply wait for the user to type 3 characters (that should limit the data set enough so you only need to make one request from the server). Check out DynamicData.mxml (in the examples folder in the zip). It demonstrates using a timer to simulate a server populated AutoComplete. There are two methods available for filterFunction,which one should be modified,i am stuck,can u help me out in fixing this??? I’m not sure I follow, these are the getter/setter to the same function. For an example of how to use the filter function check out the documentation (http://hillelcoren.com/flex-autocomplete/documentation/). I have a query regarding the behavior of the PromptTextInput box component that you’ve created. And here’s what I’m struggling with. By default, setting the prompt property displays the prompt string in greyed italics. However, if we were to type in something into the PromptInputText box…and then set the prompt property back again to the original prompt string, I’m seeing that the greyed italicized style goes away…and I see the prompt string displayed using the default style (black, un-italicized). Is this an expected behavior? And if so, how can I get the greyed italicized style back again? This is a bug which I plan to have fixed in the next version. You should be able to clear the text (and reset the prompt) by setting the text value to null. This doesn’t work though… here’s a rather ugly workaround. I have same problem of tab navigation as other friends having. I have tried the solution they had suggested and i have also tried to figure out the problem. This problem may be because of outer Grid Row which does not get the focus while tab navigation or in focus manager does have show this component in its focus component array. I have also tried by overriding tabIndex method but did not succeed. Is there other way to get the success. I’m not seeing this issue myself, if you could put together a sample application which demonstrates the issue I’d be happy to take a look at it. Actually what i am doing is that i am opening the mxml which have AutoComplete component in popup manager. When the popup open and i click on Tab key my focus does not set to component but it is working with other component. I have dropped email to you for the same. thanks again for your great component. could you help me to show it??? thank you!!! can we able to open list with all value without applying filter? means on set focus of type ahead, by default list will populated with all value. and while entering the value it will filter the list and so on. Thanks for you update, actually i had tried the same but unfortunately i am not able to open it due to _dropdown.parent is getting null in isDropDownVisible method. I have called showDropDown() method in handleFocusIn handler. And one more thing o observed is that while executing handleMouseDown handler, it will hide the dropdown. Is it possible to add comma (,) for new values. Whenever I enter (,) the selection is cleared. This is happening because we use the comma for separating items when multi-select is enabled. In the next version I plan to add the ability to specify which character to use as the delimiter. For now here’s a comment which explains the changes you can make to the source to fix this. Thanks Hillel, its working perfectly. is it possible to display “nothing found” on the Autocomplete or get a message “nothing found” if there are no matching data? One possible way to implement this could be to add a “nothing found” element to your data list. Then set a custom function which always returns false for the item unless it’s the only item left. I am using autocomplete old version and I want to migrate to newer version (AutoComplete-1.2-Fx3.swc) But it is causing the following errors. In the latest version of the AutoComplete I’ve changed all private functions to protected (so people can more easily override the behavior). It’s possible that this change has introduced some naming conflicts in your ExtendedAutoComplete class. You should just need to change the names of your functions to resolve the errors. Am new Flex , In Flex mobile Projects (flash builder 4.5 ). Autocompleteis not available could u please give advise for any alternate element to autocomplete of TextInput Control Thanks in Advance. I’m sorry, I’m not aware of an autocomplete which is suitable for a mobile project.